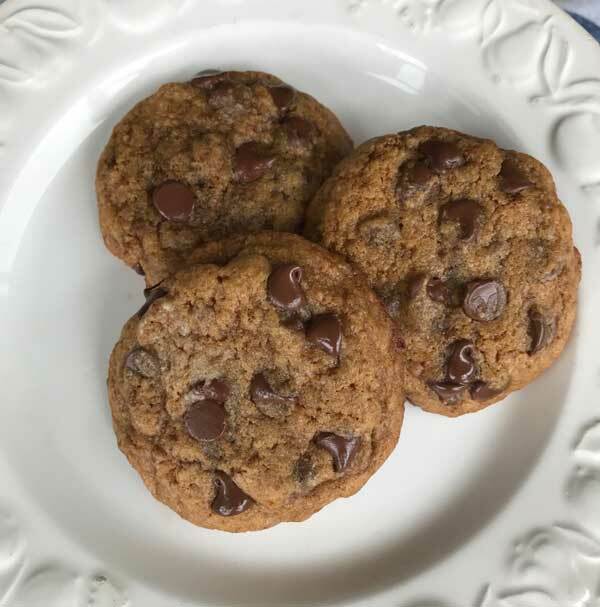 Several years ago a baker named Bunny mentioned she’d made one of my chocolate chip cookie recipes with coconut sugar. Back then I’d never heard of coconut sugar, but I searched all over Austin and eventually found it even though there was some confusion over whether it was coconut sugar or coconut palm. Bunny’s coconut sugar cookies were very tasty, and I guess she was ahead of her time because now coconut sugar is everywhere. I think of Bunny every time I make gluten-free coconut sugar chocolate chip cookies, but alas I have changed recipe. If you don’t do a lot of paleo or gluten-free baking you may need to round up the ingredients. As mentioned, the coconut sugar is fairly easy to find, and most stores seem to have xanthan gum and Bob’s gluten free flour as well. 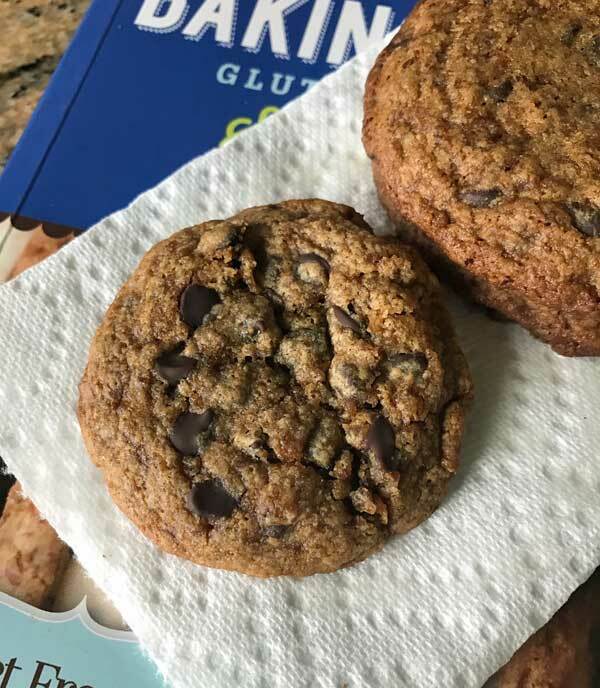 For the chocolate chip you can use any brand, but if you are baking for someone who with food allergies I recommend the Enjoy Life chips which are smaller. Also, like most doughs this one can be made ahead and frozen. I like to shape the dough into little rounds, then freeze and bake. Sometimes the cookies made with chilled dough come out a little thicker like the ones in the second photo. 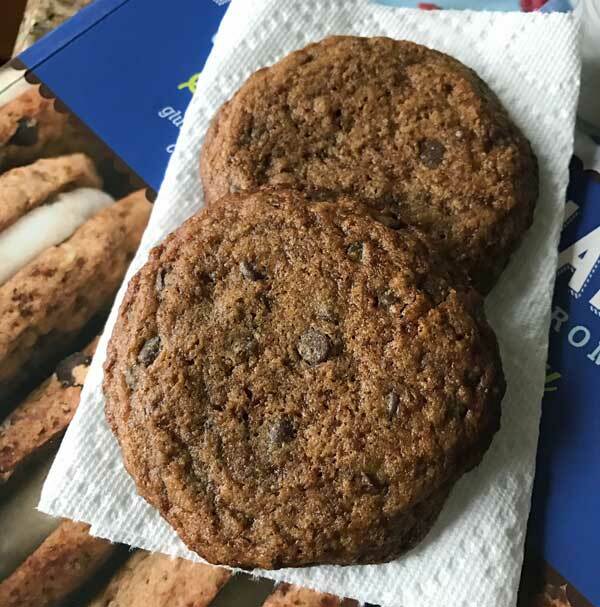 You can also make the cookies smaller, as in the photo directly above. The original recipe makes 24 fairly large, flat cookies, but you can halve each portion and make 48. 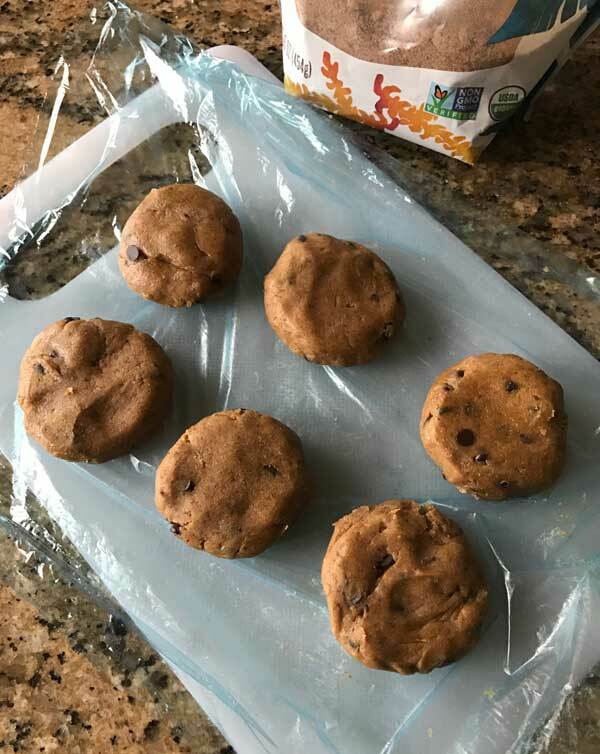 Allergy Friendly Chocolate Chip Cookies that are gluten-free and made with coconut sugar instead of refined sugar. Preheat the oven to 350 degrees F. Line two large baking sheets with parchment.In a large mixing bowl, whisk together the gluten free flour, coconut sugar, flax meal, xanthan gum, baking soda and salt. In a second bowl, whisk together the applesauce, vanilla and all but 2 tablespoons of the coconut oil. Stir the wet ingredients into the dry ingredients until blended. If the batter seems too greasy before you’ve add the last couple of tablespoons, you can leave them out and add the chocolate chips. Otherwise, add the remaining 2 tablespoons coconut oil and stir until you have a soft but scoopable dough. Stir in the chips. Scoop about 24 equal size portions of dough (about 40 grams each) and arrange 3 inches apart on baking sheets. Press down to make 1/2 inch thick rounds. Bake at 350 for about 12 minutes, turning the tray halfway after the first 8 minutes. For smaller cookies, divide the dough sections in half and bake the cookies at 325 for about 10 to 12 minutes. The recipe is based on one from Sweet Freedom Bakery in Philadelphia. The yield is 24 large cookies, but it’s really easy to halve if you only need 12. You can also make the cookies smaller and get 48. Play around and see what size you like best. Whatever size you choose, the cookies will be thin and fairly chewy. The batter can be greasy depending on how the flour is measured and the brand of coconut sugar, so I recommend not adding all the coconut oil at once in case you need to hold back on a tablespoon or so. And finally, I’ve only tested with Bob’s Red Mill Gluten Free All-Purpose Baking Flour. Other brands should work, but you might need to adjust the amount somewhat. I’m happy with Bob’s (which is what Sweet Freedom recommends) because I like the flavor, it’s not too expensive and it’s easy to find.Make sure to measure the coconut oil after you've melted, as melted coconut oil and solid coconut oil don't measure the same. Jen, I’ve only tested this one with the blend of Bob’s that doesn’t contain xanthan gum. If you are using the 1:1, it’s probably safe to just leave it out. Bobs Red Mill 1 to 1 Gluten Free Flour already has xanthan gum in it. Do I need to add extra?